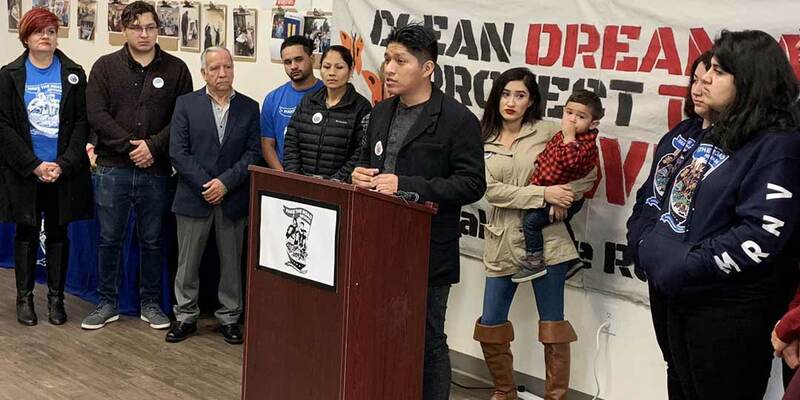 March 12,2019 Make the Road Nevada (MRNV) members reacted to the introduction of The Dream and Promise Act (DPA), which will provide a path to citizenship to over 2 million immigrants under Deferred Action for Childhood Arrivals (DACA), Temporary Protected Status (TPS), and Deferred Enforcement Departure (DED) programs. Our MRNV youth leader, Genaro Lorza spoke on the positive impact DACA has had on his life, and why a bill like DPA would allow for him and his family to have better life. DACA has opened doors for many undocumented immigrants in education and employment, removing the program will set their lives into disarray. DPA would provide the protections needed for DREAMers by finally granting them a pathway to citizenship at the same time, allowing them to continue to contribute to the country they call home. According to the Center for American Progress (CAP), in Nevada alone there are 3,600 Dreamers that would benefit from the passage of this bill. These are our friends, families and neighbors that deserve to be protected and feel welcomed in their communities. MRNV applauds the introduction of the bill in the house, it is a step forward in right direction for all 11 million undocumented immigrants. Since the 2016 elections, immigrants have been vilified by President Trump and his supporters, causing many immigrants to fear for the worst. With many Obama-era programs at risk, DACA was at the forefront due to the anti-immigrant agenda. DPA is a beacon of hope for the 2.1 million Dreamers whose future has been in the air since the beginning of the Trump presidency. A Small Victory & a Big Step Towards Earned Paid Sick Days for Nevada!